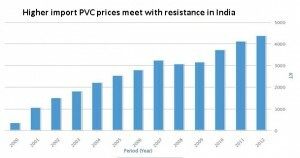 Initial import PVC prices for March have been announced with increases to India this week in accordance with rising upstream costs and the firming global trend, according to data from ChemOrbis Price Index. Buyers had been expecting to see more modest increases for the coming month and are offering resistance to the new prices. A major Taiwanese producer pioneered March price increases to Asia by announcing $70/ton hikes to China and $50/ton hikes to India. “Our new prices are meeting with resistance and we received bids from Indian buyers at levels $20-30/ton below our current prices. Nevertheless, we plan to maintain a firm stance on our prices and we believe that buyers will eventually accept our new prices,” a producer source reported.